It’s not every day that you get to work in a film like ‘Kusa Paba’, says Pooja Umashankar. A well-written script and a Director with focus and clarity do not often come together. Veteran film Director Senior Professor Sunil Ariyaratne’s ‘Kusa Paba’ has been hitting the headlines of newspapers ever since its announcement. The movie stars seasoned actor Jackson Anthony and Pooja Umashankar in lead roles. Many popular faces adorn the movie: Ravindra Randeniya, Chandani Seneviratne, Veena Jayakody, Palitha Silva, Kusum Renu, Roshan Ranawana, Mahendra Perera, Mahinda Pathirage, Gamini Jayalath, Ariyasena Kaluwarachchi, Dimuthu Chinthaka, Dhanawardena Guruge, Harsha Sirimanna, Ranjith Dissanayake, Krishantha Erandaka, Bakthi Mendis and many others. Based on the 523rd story (Kusa Jataka) in the Jataka story series, the film portrays the defiance of Pabhavathi towards Kusa once she discovers his grotesque looks. The movie is the first production of the Sri Lanka Cinema Creations Foundation which is made up of many renowned producers and directors. It will be screening at 50 theaters belonging to the EAP, MPI and Rithma circuits from January 26. 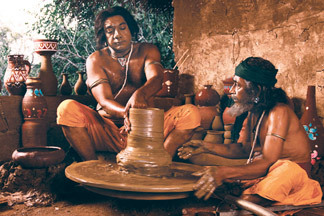 Q: Many artistes like King Parakramabahu (Kav Silumina), Alagiyavanna Mukavati (Kusa Jataka Kavya) John Mertheenuss Pavulas Pieries Samarasinghe Sriwardena (Kusa Nadagama), John de Silva (Kusa Jahtaka Drushya Kavya) and Prof Ediriweera Sarachchandra (Pabavathi) have based the 'Kusa Jataka’ for their productions. They portray Pabavathi's nature in a more sympathetic angle than that of the cruel woman in the Jataka tale. What is your take on Pabavathi? A: The Buddha related this Jataka tale because he wanted to stress on the fact that females are an unfortunate set of beings. The reason he told the story was because a bhikku had seen a beautiful woman and had lusted after her. The Buddha revealed that he too had been blinded by beauty in one of his previous births. Any educated, headstrong man will face destruction if he is overcome by lust. However critics say that the Buddha could not have made such a point because he brought justice for women. Therefore some of them had altered the ‘Kusa Jataka’ to tone down Pabavathi’s cruel behaviour. She was stubborn and snobbish due to her incomparable beauty. She had addressed Kusa with many names like ‘monkey’ and had told him to find someone equally ugly because she does not wish to share her life with him. The original Jataka does not tell any positive characteristics related to Pabavathi. Therefore some writers in the 13th century altered the tale so that the readers will look at the princess with a sympathetic eye. These indicate that Pabavathi’s obstinate manners were a result of queen Seelavathi’s deception. Seelavathi plotted to bring the teenage princess and Kusa together so that they will meet only during night time. This was to ensure that they can produce a child as an heir to the throne. This was stressful to Pabavathi who yearned to catch a glimpse of her husband’s face. King Parakramabahu did not point out straight that this was the reason why Pabavathi rebelled against her marriage. He merely worded the poems in a manner so that this picture too is painted in the reader’s mind. Prof Sarachchandra too looked at Pabavathi’s dilemma with compassion. Dr Tissa Abeysekara wrote the script of the film to project the good and bad aspects of Pabavathi. Kusa too has his plus and weak points just like any other human being. These are brought out in the film as well. Dr Abeysekara had paid special attention in building up Pabavathi’s character. It is similar to the picture depicted in ‘Kav Silumina’ but he had etched it in a manner so that there is a more vivid portrayal of the princess. She gains the compassion from the audience rather than their wrath. Q: You have done historic movies before when you did 'Kristhu Charithaya' and 'Sudu Sevanali'. What kind of new experience did making 'Kusa Paba' offer you? A: One of the reasons that directors do not engage in making movies based on history is because they demand huge sets. It is very difficult to do outdoor shooting because landscapes have been modernized. You cannot show people walking on a road layered with tar or antennas on buildings in the horizon. It is very difficult to avoid these elements. I faced these challenges to a certain extent in my previous movies. ‘Kusa Paba’ differed from them not only because it goes decades back even before Christ but also because the setup is based in India. We were careful in selecting the costumes and the background for the scenes. Our biggest challenge was finding a place to build the sets. Asoka, Sri Lanka biggest studio, was destroyed during the 1983 ethnic conflict. This is a real tragedy because we lost a venue where we could have built big sets for movies. Luckily the Ranmihithenna studio was available and ‘Kusa Paba’ became the first film to be shot there. We shot around 99 percent of the indoor scenes in Ranmihithenna. Q: Did your experience of making 'Kristhu Charithaya' and 'Sudu Sevanali' help you in directing ‘Kusa Paba’? A: Definitely. I would have made 'Kristhu Charithaya' in a different manner had I done it today. We had a lot of problems when we did the movie. Vijaya Kumaratunge acted the lead and the prevailing government of the time believed that the role would have been advantageous for him in a political sense. They banned the movie from being shot for several years. I would have made a much better production with certain changes if I got the opportunity to make the movie today. Q: How is the moral theme of the ‘Kusa Paba’ relevant to the present society? A: The best texts in the world are the ‘550 Jataka Stories’ and the ‘Bible’. Any educated man or woman needs to read these texts because the stories are timeless. They comprise deep themes and humane ideologies. ‘Kusa Paba’ projects sacrifices people make in the name of love. This is not limited to any ethnic group, class educational status or age. The main aspect of this story is eroticism. It is a tale of two lovers. If you look at the story from the Buddha’s aspect, people suffer due to love and lust. These experiences are common to the contemporary youth. A: It was the climax of the film where there were seven elephants, five horses, around 1000 extras and many actors. We had artificial rain and thunder for the finale. We shot the scenes for a continuous five days and using two cameras: one imported from India and the other owned by Dilmon Jayaratne. Another difficult scene is the ‘Madhura Wasanthaya’ dance item. We had 50 drummers and hundreds of dancers in the background. Q: 'Kusa Paba' is a collaborative effort by the Sri Lanka Cinema Creations Foundation. A: This is the first time in our history that so many veteran producers and directors were working on one set. There were some directors who were more experienced than me, who had bagged awards more than me and who had profited from films more than me but they did not come to meddle with my work at any stage. They supported me tremendously. It is four years since this script had been written. I was unable to find a producer to fund the project. Had it not been for their strength, I would not have been able to make this movie. Season film-maker Sumitra Peries began work on her much awaited production ‘Vaishnavee’ on January 10 as she joined hands with Asia Digital Entertainment. The script of the movie is based on a story penned by Dr Lester James Peries and scripted by Tony Ranasinghe. Expected to be a trailblazer in the Sri Lankan cinema industry, ‘Vaishnavee’ is a story revolving around a puppet that has fantastically come to life. It is a fantasy genre movie which demands technologically advanced special effects. Therefore it will be shot using the Red Epic 5K, one of the most advanced digital cameras. This will be the first time that the Red Epic is used to shoot a Sri Lankan movie production. “This is be a momentous moment for Lester and me. The concept for the film had been with us for many years but we never got the chance to put it into motion. This is the first time that we are venturing out with the new technology. I am a little intimidated but the adventurous streak has not left me yet,” Sumitra said adding that she hopes that the industry will be rejuvenated with the new technology. 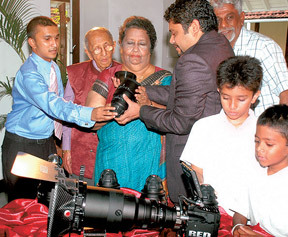 Speaking at the muhurath ceremony Asia Digital Entertainment Chief Operating Officer Lalinka Muthukumarana said that Dr Lester James Peries and Sumitra Peries are the figures who created Sri Lankan cinema. “In 1956 ‘Rekawa’ was the first Sri Lankan movie that was produced entirely within the country. It is considered the first 100 percent Sri Lankan-made movie. That is why we thought of inviting Dr. and Mrs. Peries to play such a pivotal role in the recreation and evolution of the Sri Lankan cinema industry towards digital technology,” he said. The Red Epic camera manufactured under the brand name Red is a highly advanced digital camera produced in the USA. The founder of the Red line of cameras, Jim Jinnard, created it with the focus of introducing the most advanced digital camera in the world. The Red Epic comprises a list of endless features, enabling the camera to capture up to 120 frames per second, each frame at full 14MP resolution and capturing at 5K. The Red Epic has been used in a number of leading movies in Hollywood, including ‘Pirates of the Caribbean’, ‘Angels and Demons’, ‘The Hobbit’ and ‘The Girl with the Dragon Tattoo’. Asia Digital Entertainment has exclusively trained cinematographer Vishwa Balasuriya at the RED Studios in Hollywood to operate the Red Epic. He is also capable of training others to use the camera. Popular actress Yashodha Wimaladharma will ignite the screen again in ‘Viashnavee’. Thumindu Dodanthenna will take on the lead male role. Shehara Hawadewa will debut to cinema through the movie. Acclaimed cinematographer Donald Karunarathe will be the director of photography for the project. 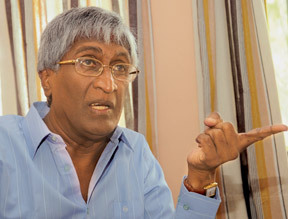 ‘Vaishnavee’ will be produced by Manohan Nanayakkara. The SAARC Cultural Centre (SCC), Colombo, has decided to screen movies from each of its member countries in an attempt to bring member states of the SAARC region together embracing culture and recognizing unity through diversity. 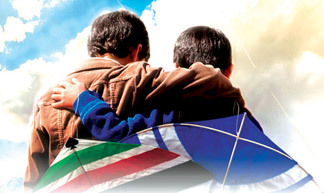 'The Kite Runner', a Marc Forster film based in Afghanistan will be the first of many films to be screened for SAARC Day. 'The Kite Runner' will unspool at the National Film Corporation cinema hall on January 23 at 6.30 pm. This movie is a fascinating historic epic, set in the 20th century Afghanistan in 1978. It is based on Khaled Hosseini’s book with a globally diverse cast and crew, mixing a remarkable group of non actors from Afghanistan. SAARC is an association established for corporation between South Asian Countries. Afghanistan, Bangladesh, Bhutan, India, Maldives, Nepal, Pakistan and Sri Lanka are the current members of SAARC. It is a regional centre established based on the decision made by the heads of state or governments of SAARC countries to promote cultural cooperation in order to bring the people of South Asia closer and to project the distinct identity of South Asia. The centre is intended to function as a major meeting point for the artistic communities of the member States. The Centre will provide the necessary facilities and conditions for individuals and groups in various fields of interest to meet and interact in a conducive environment. It is intended to cater to all forms of art such as performing arts (e.g., dance, music, drama, theatre, puppetry and folk culture), visual art (e.g., painting, sculpture, film making, photography) and literature. If the plot about stealing a mind-boggling amount of gold bullion by creating a monumental traffic jam sounds familiar, that's because it was the basis of Michael Caine's finest hour in ‘The Italian Job’ (1969). F Gary Gray remade ‘The Italian Job’ in 2003, moving the story from the streets of Turin to Los Angeles and putting Mark Wahlberg in the lead role. As far as remakes go, it wasn't half bad. Now it's Bollywood's turn to put a spin on the original Troy Kennedy-Martin script. Although Abhishek Bachchan is not quite up to the standard of Caine, the troupe pull off their own remarkable heist, making ‘Players’ a bigger, larger and more fun version of the tale. It's also a curiosity that what started out as a lean 99-minute British heist movie became a 111-minute Hollywood blockbuster and is now an almost three-hour flick to Hindi cinema. ‘Players’ will begin screening at Liberty cinema from January 26.